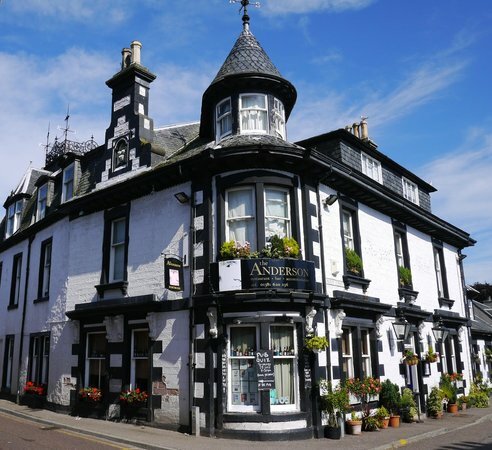 The Anderson is your gastronomic oasis in the Scottish Highlands. From Aberdeen Scotch beef to West Coast seafood to Scotland's finest creameries and wild game, we cook with only the best produce. When these magnificent ingredients are used in our “borderless” approach to cooking, the result is an ever-changing menu of Global Cuisine that lends a cosmopolitan air to this quiet seaside village, inviting comparison to Scotland’s finest restaurants and resorts. Late diners & families welcome, and you may always dine with your dog in our Pub. All baking is done in our kitchen, our coffee is 100% guaranteed Fair Trade, house-blended and ground to order. The Anderson is in a historically-certified building on Cathedral Square in the center of the seaside conservation village of Fortrose. Most of the structure dates from the the 1840s, although parts of the wine cellar are nearly 200 years older. On the ground floor are our 50-seat dining room, cozy Whisky Bar and firelit country pub. Upstairs are 9 ensuite guest rooms appointed with a combination of antique decor and modern conveniences. We're an easy walk from pristine beaches, dolphin watching, forest walks and our seaside links golf course designed by James Braid.